Milla Jovovich and Ali Larter visits early today (January 26) the “Good Morning America” in New York. Here is the video and I have added screen captures, which you can see on the our photo gallery. 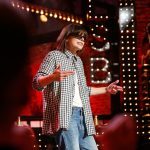 On this Thursday, Milla Jovovich appears on the 3th season of “Lip Sync Battle” where she fight in the Battle with Ruby Rose. This episode airs on January 26 at at 10PM ET/PT. In advance of the episode, Spike shared photos from the taping and a video clip. Milla performs “White Wedding” by Billy Idol on the video above. Milla Jovovich and Paul WS Anderson was arriving to the Korea for Resident Evil: The Final Chapter premiere, which starts tommorow (January 13) at 7 pm (local time). Here is some photos Milla´s stay in Korea. On January 13, Milla Jovovich attended at the Resident Evil: The Final Chapter premiere in Seoul (South Korea), and was joined by husband Paul WS Anderson.